We understand the resistance and concerns of many customers who feel the pressure to consider off-shore sourcing. We have seen the false starts and failed projects when an unprepared company attempts to launch an off-shore relationship. Our experience and proven success provides our customers with the confidence to succeed in their off-shore sourcing projects. Ace Precision International focuses on matching the needs of our customers with the capabilities of our suppliers. Our planning effort is integrated and coordinated with our customers and suppliers in an effort to precisely adhere to our customer’s requirements. The goal of Ace Precision International is to deliver a quality product at the lowest possible cost through the implementation of a highly coordinated manufacturing planning process. Our planning control system provides a means of planning, executing, and reporting that effectively improves the flow of product from our supplier partners to our customer’s plant. Project development and management is a key to long term success. The project managers at Ace Precision International are skilled professionals with the knowledge and ability to ease the transition to off-shore souring. Ace Precision International is constantly meeting with representatives of companies wishing to become supplier partners. 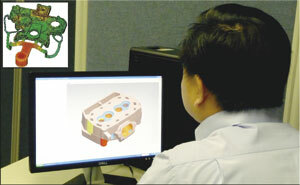 Our on-site survey team examines their internal quality systems and manufacturing processes. Our background as a TS16949 certified manufacturer allows us to identify “best in the industry” practices. Ace Precision International has sources for all types of castings as well as fabrications, stampings, injection molded plastics, machining, and other manufacturing processes. From custom engineered products to standard off-the-shelf components, our supplier partners look to us to provide new customers to their factories. We provide expertise to link their manufacturing capabilities to your exacting requirements. Our success in doing this has convinced our customers of the advantages of off-shore sourcing. We don’t just bridge the language and culture barriers, we bridge the technology barrier.